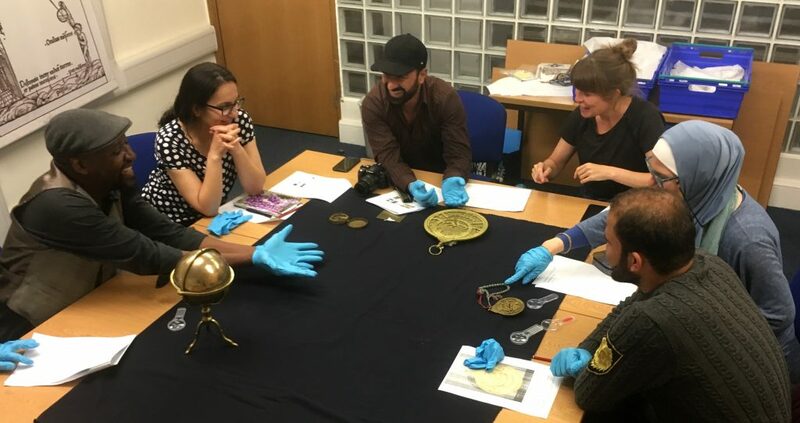 Thabo, Nuha, Tammam, Rachel, Rana and Abdullah from the Multaka-Oxford team looking at objects from our collections. We are excited to let you know more about Multaka-Oxford, our new project funded by the Esmée Fairbairn Collections Fund. It will be running until September 2019. The project will create volunteer opportunities for forced migrants and use museums and collections as a ‘meeting point’ to bring people together. We are jointly delivering Multaka-Oxford with the Pitt Rivers Museum, and with local community organisations, grass-roots groups and individual people. It focuses on two collections at the museums: our Islamic astronomical instruments, and a recent acquisition of textiles from the Middle East at the Pitt Rivers. Our project is inspired by ‘Multaka: Museums as a meeting point’, based in Berlin. 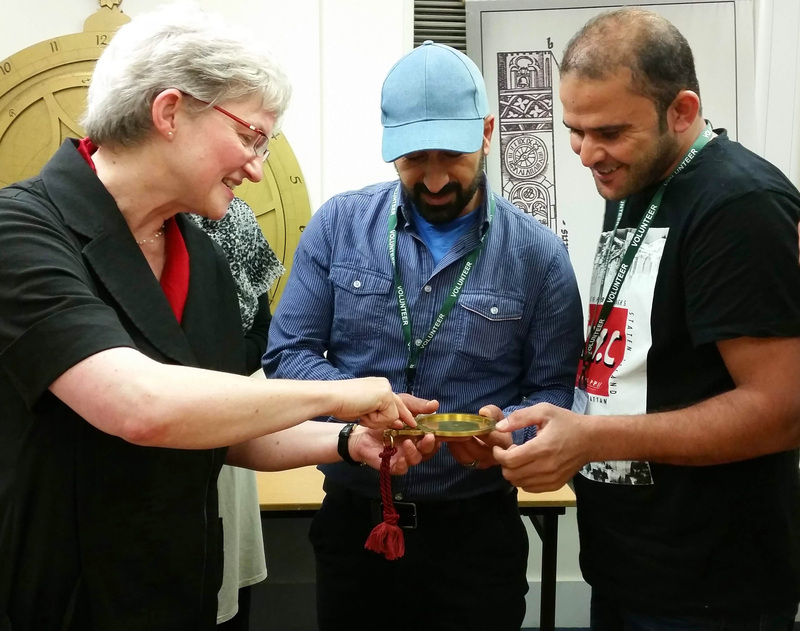 This project trained volunteers to create Arabic tours across four museums in the city. Multaka is Arabic for “meeting point”. The aim of the Oxford and Berlin projects is to create places where people can meet and share their experience, knowledge and skills. Through this, we will improve understanding and engagement with the collections, whilst also supporting people to build confidence, gain work experience and support community integration. Rana Ibraim, Silke Ackermann (Director of the Museum of the History of Science) and Rachel Harrison. The Multaka-Oxford team are Nicola Bird (Project Manager), Rachel Harrison (Community Engagement and Volunteer Officer), Rana Ibrahim (Museum of the History of Science Collections Officer) and Abigael Flack (Pitt Rivers Collections Officer). Already we have 9 volunteers signed up and giving their time generously to the project. Silke, Tammam and Abdullah looking at a replica astrolabe. Why did they join Multaka-Oxford? The volunteers have lots of knowledge, inspiration and ideas that connect with our collections. We are looking forward to sharing this knowledge widely. Everyone has brought a new skill to the project. Tammam Aboukerech has taken lots of the project photographs. Tammam is a photographer and he will be helping us to visually document the project. Gihan – a talented designer – will help us to create our project logo and identity. You can discover more about Multaka-Oxford on our Tumblr page, or by following the hashtag #multakaoxford on Twitter.